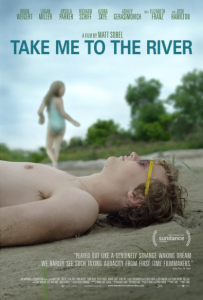 Verdict: Relying too heavily on ambiguity as a source of faux-tension, “Take Me to the River” is a muddled attempt to tackle too many subjects. “Take Me to the River” has a lot of feelings. So many, that it’s pretty devoid of them, in fact. With so much to say, it packs in too many half-baked ideas and ends without thoroughly exploring any of them. The film opens on Ryder (Logan Miller) and his parents driving from California to a family reunion in Nebraska. Ryder insists they tell their extended family he’s gay; his mom Cindy (Robin Weigert), concerned about how her conservative family would take the news, tells him to keep it on the DL. In protest he shows up to dinner in fitted short-shorts and a deep V-neck tee (ah, teen angst). The silence proves a problem when Ryder goes off to play with his young cousin Molly (Ursula Parker), who is a tad weirdly adoring of her cool West Coast cousin. When she returns to the family screaming with a blood stain on her dress, her father Keith (Josh Hamilton) accuses Ryder of sexual abuse. At a tight hour and twenty-minute run time, this movie should be packed. There’s a lot of potential here: conflicts of culture and sexuality, dark family secrets, intrigue and monstrosities around every corner. With enough insight and a light touch, this could have easily been a tense, probing film. Problem is, “Take Me to the River” doesn’t know what it wants to be. Is it a teen psychosexual drama? An “insidious family secret threatens to tear everyone apart” flick? Or should I put more stock in the cultural clashes between progressive Californians and their conservative Nebraskan family? Writer/director, Matt Sobel, tries to tackle all of these, but fails to weave them all into one narrative. Leaving me to think that there was a single point that got shrouded in extras. The narrative confusion is exacerbated by the nonsensical things everyone does. Clear character motivation falls by the wayside of insurmountable vagueness, and uninspiring performances keep physical cues from helping to explain what in the heck everyone thinks they’re doing. All but Robin Weigert, that is, who plays Cindy with enough nuance to suggest a real struggle to keep the reunion trauma free. Nonetheless, it’s weird that she claims to believe Ryder, but continues to tiptoe around her family despite initial outrage at their accusations. Ryder’s outsider status and desire to make a point explains a lot of what he does, but not the odd moments like cruelty to his loving mom. Keith and Molly are consistent with the vagueness of the plot, with Hamilton sticking with crazy intensity and Molly being kinda weird the whole time. There’s something going on with them, but I have no idea what it is. What happened to Molly isn’t the issue; her situation is never explained, but you can sort of guess. It’s the Big Bad Secret between Cindy and Keith that becomes the film’s focus. I straight up have no clue what happened or why it was such a big deal. Ryder and Molly’s roles in this revenge plot, if that’s what it is, are so unclear that the only connection I came up with is really disturbing and almost too insane to be true. Vagueness isn’t necessarily a bad thing. Plenty of films pull it off by focusing elsewhere, on feeling or character over plot, and that can work. But I left “Take Me to the River” with the feeling that I was supposed to get something out of it, some point about the longevity of pain or family dynamics or sexuality, but I didn’t know what. I’m not into that. If you’re gonna make a point, make it clear. Otherwise you’ll leave the audience floundering under a lot of hollow content. I agree with everything you said 100% when the movie ended it just pissed me off because it got soo weird but there was no full explanation of what the hell happened. Had potential but it sucked.